All hail the god of valor, the Archpaladin, the Valorous Knight, the Invincible! Join the chivalrous cavaliers who quest in his name, learn the tenants of his noble faith, and strike fear in the hearts of all foes of justice! After a lengthy isolation, the modrons march again! Venture to Regulus, the home city of these whimsical beings of perfect law, encounter the six most numerous types of modron, and explore the planes as a rogue modron PC. Discover the benefits of adventuring through your twilight years. The Ecology of the Kopru, Volo's Guide, Dragonmarks, Class Acts, Scale Mail, Sage Advice, Savage Tidings, and comics, including The Order of the Stick and more! Heironeous, Modrons, long-lived charcaters...all of this was well done making #354 one of the best "reads" of a Dragon magazine I've had in awhile. I especially liked the modron-related material and the reference to the Tertiary modron in the Dungeon adventure "Diplomacy". April is the month of the Modron! Just wanted to write and say that I completely disagree with the small vocal minority that claims Dragon is going downhill. Issue 354 proved that wrong in a big way!!! I love Modrons and was extremely happy to see them back ; I say every April should be Modron month!!!! Even small articles; and say.... how's about an adventure over in Dungeon sometime soon? I think I am one of the few gamers who appreciates the Modrons and their place in D&D history. Granted when they first appeared in the 1st edition of Dungeons and dragons I overlooked them and thought to myself "Oh man, the D&D designers have officially run out of ideas for monsters!" It wasn't until they were brought back into D&D 2nd Edition through the Planescape setting that I truly became interested and actually appreciated the Modrons! I was saddened that they only received a brief mention in the Manual of the Planes for 3rd ed with no real substance. The Modrons were replaced by "bugs" (FORMIANS) and the Inevitables (which I liked). 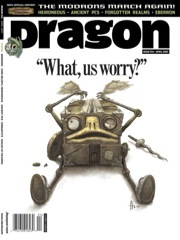 When I heard that Dragon was going to feature the return of the Modrons in issue #354, I rejoiced! Ken Marable does an EXCELLENT job bringing these guys back for 3rd Edition D&D! Julie Dillion's artwork is also EXCELLENT! This alone was worth the price of the issue for me! The article on Heironeous is also worth mentioning! Overall a GREAT issue! 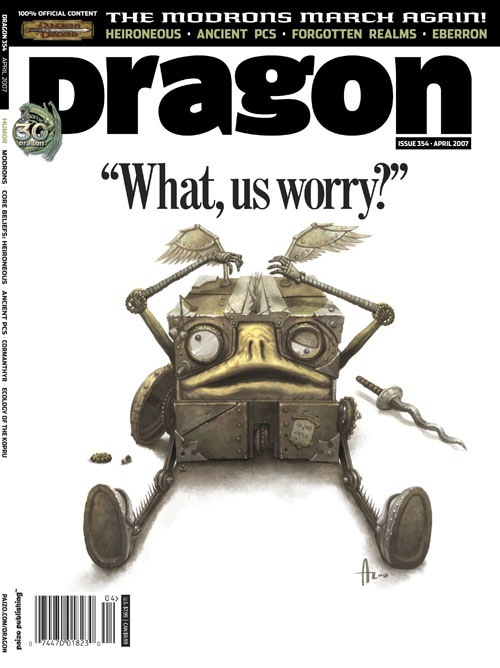 Sign in to start a discussion about Dragon Issue #354!